The funny thing about fulfilling a lifelong wish is that you never think about the After Happily Ever After. As I’ve said before, I’ve been dreaming about being on The Today Show’s sets since I was a teenager, long before I was a food writer, associate creative director, advertising copy writer, past life regressionist (don’t ask), waiter (read: actor), college student. Don’t get me wrong—it was more than I ever imagined it to be. So, the breakdown: Renee, Cindi, The One, and I were met precisely at 7:30 a.m. by a Lexus limo that whisked us to the side door of the Today Show. Adrienne, one of NBCs pages, escorted us into the green room, where my entourage hung out while I went upstairs to the studio kitchen to prep for the segment, with Bianca Henry (food stylist extraordinaire) and Lish, her assistant. Not long after, Adrienne ushered Renee, Cindi, and The One into the studio, where we proceeded to take far too many pictures. Now, time for a public apology to Bianca: I know I was supposed to prep, but I was so confoundedly awestruck by the whole experience, all I could do was stand there with an idiotic grin on my face and nod every time you asked questions like, “Is this the right dice for the presunto?” or whenever Lish chimed in with “This thin enough for the onion slices?” All I could think was: These women are prepping my recipes for a national TV show. Mark Traub, Today Show stage manager and new commenter to this blog, came in to say hello at some point. We chatted a bit about the segment, then off he went to attend to, I think, Janet Jackson, who shared the guest roster with yours truly. Then in came Ms. Producer A. Finally, I was able to put a face to the folder of messages in my inbox. She was as friendly and warm as she was in her e-mails. And even though she was supposed to be in the control room, she hung out a bit talking to all of us, making me feel oh so welcome. Then it was time for hair and makeup, which is where I made the first of my two gaffes for the day. Barbara Corcoran, one of the stars of Shark Tank, founder of the Corcoran Group Real Estate, and The One’s former boss, was in a chair getting made up. I sidled up to her and said, “Barbara, you don’t know me but my partner is [insert The One’s name here], and he’s with me upstairs because I’m doing a food segment. Would you mind terribly stopping by the kitchen and saying hi to him? I know he’ll die.” Before she could speak, a booming voice came from behind: “Excuse me! Could you please go get dressed and get out of the way?” It was the alpha dog of the glam squad. Gulp. Barbara grabbed my arms and nodded yes, and then I slunk away, like a puppy that had wet the carpet, to put on my spanking new (Spanx-less) blue sweater. Then it was my time in the chair. “There’s a thousand bucks in this if you can make me look 10 years younger and 50 pounds thinner,” I said to one of the glam squadettes. “It’d cost a hell of a lot more than that if I could!” was her answer, which made us both laugh. Kind of my way of putting a Band-Aid on my earlier social snafu. Back in the kitchen I was fitted with a microphone and taken through the blocking of the segment one last time. 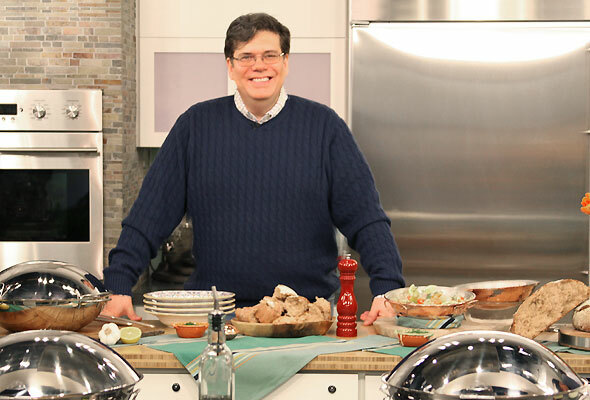 Then in a matter of seconds three huge cameras rolled into place, a brigade of crew members crowded the studio, and Al Roker breezed into the kitchen. He was utterly gracious, extending his hand and talking knowledgeably about my book. (Clearly, he had looked at it.) The next thing I knew Bianca, Lish, and the entire kitchen crew had evacuated the set. We were on the air. Live. In front of millions of people. I wasn’t the least bit nervous. In fact, I was unconstitutionally calm. The only thing that threw me was that under each camera was a monitor showing Al and me—Al and me, I like the sound of that—just as if I were watching at home. Although I was tempted to sneak a peek to see if the NBC brass had gone out and bought that slimming camera lens I had demanded, I ignored the monitors and focused on Al. The segment flew by, with the “wok on top” line that cracked up the crew. (You can hear them laughing in the background.) But then the second gaffe: the clams. I forgot the clams! And, no, it wasn’t staged. I really, truly forgot them. Someone had placed them to the left of one of the gorgeous cataplanas (made by Silampos. All the other ingredients were to the right, which is where I’ve placed them for the past two weeks while rehearsing at home. Still, though, Imagine forgetting clams in a dish called “Clams in a Cataplana.” On national TV. A few seconds later Al and Natalie Morales, who joined us during the final moments of the segment, were eating on camera. The moment it was over, the crew descended upon—and I do mean descended upon—the food. (This always happens whenever I do TV, and it’s immensely gratifying. After all, they don’t have to eat it and say they like it—they’re not on TV.) But they did. And in a matter of 10 minutes four cataplanas full of seafood were devoured. Even Al and Natalie hung around a bit to finish their share. Because there weren’t any other food segments that day, we were able to stay in the kitchen while the crew cleaned up. Ms. Producer A. came down again from the control room to congratulate me. The smile in her eyes was enough for me to know that, despite all my craziness these past few weeks, I done good. But here, dear reader, is the crux of the story. TV is vampiric. Once bitten, you’re hooked. It’s broadcast heroin, and you’re always jonesing for more. It’s an insistent itch that—without a show of your own—you can’t scratch. I woke up yesterday morning with a dozen or so treatments for TV shows dancing in my head. I scrolled through my address book to see where I could score another hit…er…I mean, segment. I was able to book Connecticut Style, the first show I was ever on. Bereft of any other TV shows, I started my way down the list of radio programs. On which show could I snag a dime bag’s worth of air time? I looked in the mirror and began pulling up my forehead, deciding if a brow lift is right for me. Maybe a few nip tucks? That afternoon, unable to concentrate on work, I conducted an episode of “The David Show” in the kitchen, taking our utterly disinterested cats, Chloe and Raja, through the process of making rugalach. Dr. Drew Pinsky needs a new show (and I, of course, could be on it): “TV Addiction House,” because this madness doesn’t stop. For example, I’m writing this on the train to my parents’ home, in Massachusetts, where tonight I’ll be the guest of honor at a Cook the Book event at Al Forno Restaurant, in nearby Providence. For at least the past 20 miles I’ve wondered which is my good side, trying to catch my reflection in the computer screen. I’m dismayed that my fellow passengers aren’t sheepishly leaning in to ask, “Aren’t you that guy who was just on The Today show? You know the ‘wok on top’ guy?” But, alas, there are no cameras around. My life isn’t a reality show. See what you have created, oh mighty NBC? See? SEE! Well, well, son, BRAVO! We praise God for the blessings He’s bestowed on you, and how you’ve run with them. Great show, great humor, great food! Thanks, mom and dad. The show may be mine, but I got the humor and food from you. David, You are perfect just the way you are. Don’t change a thing. And if you get a cooking show where you do world travel and report on food, I hope I can still be your Ms. Producer A. Congratulations on a job well done. The crew hopes you come back to feed them again. David is fond of saying that he was, “meant to have a staff,” much in the same way my mother likes to say, “We’ve always lived in a castle.” So, David, we were very happy to oblige for the morning, allowing the Lord of the manor to survey his staff, relaying approval with a nod of his head. I must say, it came natural to you. As did being on television. Bravo! to a fabulous segment, and a beautiful 3 1/2 minutes of culinary teaching. And I’m sorry about moving those clams to the left side of the cataplana. Bianca, if you didn’t move the clams to the left of the cataplana, the segment wouldn’t be nearly as real and fun as it is. So fear not! The Lord of the Manor is mightily pleased. Thanks, Steve. I thought that was kind of funny, too. Is there a conspiracy brewing to create “The David Show”? I hope so. Agree with Steve, the duet with Al was priceless, and “wok on top” is going to be a classic. Thanks for the link and giveaway for the cataplanas. And… thanks for allowing us all to share the journey with you, through this series of posts. It’s been a great ride to watch, and the results—the national TV debut—couldn’t have been more YOU. You’re a natural, the segment was so real, honest, and just delicious in every way. Bravo. Allison, not so much a conspiracy as a campaign. If I can get 5 million signatures, a network somewhere somewhere will HAVE to give me my own show! I thought it was a very good segment, David, and I like your sweater. And I hope your further dreams are fulfilled. My wife and I were at Al Forno last night and thoroughly enjoyed ourselves. The food was fantastic, the wine never ended, the conversation stimulating, and the guest of honor was as gracious as can be. Your cookbook now stands proudly in the kitchen! João, thank you for coming. The evening was wonderful, and David, Al Forno’s chef, did a great job. Of course, owners Johanne Kileen and George Germon were very gracious. It was a memorable evening for all. Gold star to David Leite. You have been being “ready-for-primetime” and I hope it all goes forward as you dream it. You seemed right at home, warm, smart, real, and the food looked fabulous, too. Thanks for the story before and after, that was the real treat (since I got no clams to taste). Thanks, Nancy. Let’s keep fingers crossed about the future! Thanks so much for posting the video of your “Today” debut. If I’m not transporting our son to high school, I’m preparing to transport myself to work, and so seldom have “Today” viewing time available. Kudos! You struck me as personable and seemingly very at-ease, at-home, in your element. And the clam thing—no big whoop. You breezed right on through it and didn’t miss a beat. I was reminded of when we took our son to New York six years ago, and we enjoyed a cataplana of fresh clams at Alfama. Our son was so enthusiastic he reflexively reached for it and burned his fingertips a wee bit; but was undeterred from rapidly consuming—and heartily approving of—the bounty within. Thanks for the memories; and congratulations on creating your own with great success. I’m sure you’ll be back to the “Today” crew. Judith, my pleasure regarding the memories. Gaffe with the clams – what gaffe?? It was a nice ad libbing touch! Muitos felicitações, David!! Yeah, that seems to be the consensus: What gaffe?! Congratulations David! What an awesome segment! You are a natural in front of the camera and just watching you made me want to re-create that wonderful dish! I hope they put you on as a regular! Nice job! HONEY! You were fabulous! Big time congrats to you, and I’m also zipping up and catapulting a big hug all the way from our vacay in California to NYC to you. Thanks, Jaden. Coming from you, Ms. TV, it’s much appreciated! Querida Leticia, obrigado. Now we have to get you and your new book on The Today Show! I was happy to catch your segment and look forward to your next appearance! The dish you prepared looked magnificent! Excellent job, you’re a natural!!! Thanks, Tasha. It’s much appreciated! Wow, I loved seeing the clip, then reading the behind the scenes play by play. As an aspiring author, this is my dream, too. I hope when my time comes I can handle media with your aplomb. Also–the dishes looked so great. I was in Lisbon & the Douro in November and well remember how flavorful rustic Portuguese cuisine is, especially paired with a juicy Douro red. Cheers! Diane, thank you for the kind words. I look forward to when I can view you on the Today Show! Article? Hilarious. Video? Very good. Keep doing what you do best. Thanks, Carol. That very heartening. Much appreciated. David, how delightful to see you on the Today Show-only sorry i missed it live! I am so happy for your success! Thanks, Teresa. Now, please make my day: is this Theresa McKeon from high school? Outstanding film clip! I enjoyed watching it very much…awesome recipe.